Jan has had an interest in massage and healing since 1995 but did not begin formal training until 2003. 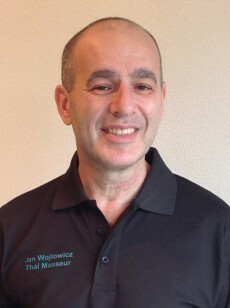 His main area of expertise is Traditional Thai massage and he has trained in the UK with various highly regarded teachers including Andrea Baglioni from Thailand’s Sunshine Network, Maria and Graham Mercati from Bodyharmonics, David Lutt from Osteo-Thai, Simon Piers Gall from The London School of Traditional Massage and Nikky and Fiona Smith from Bodywisdom. He has also trained in Thailand with the International Training Massage School as well as spending time with the legendary Pitchest Boonthume. Whilst in Thailand Jan has also worked in the popular street massage salons. Initially proving his skills on the therapists and salon owners and then working alongside the Thai therapists he worked long hours into the night but gained great insights and expanded his knowledge of the treatments. Specialist in: Massage, Thai Foot Massage, Thai Massage.